Many people have heard that the early makers glued their fingerboards on before varnishing the instruments, and that there’s no varnish under the boards, but it’s not something you get to see very often. This is a Dutch violin from around 1700. Notice that the central area that’s been hidden under the fingerboard is a little more grey colored than everywhere else? That’s because that area has no varnish at all. 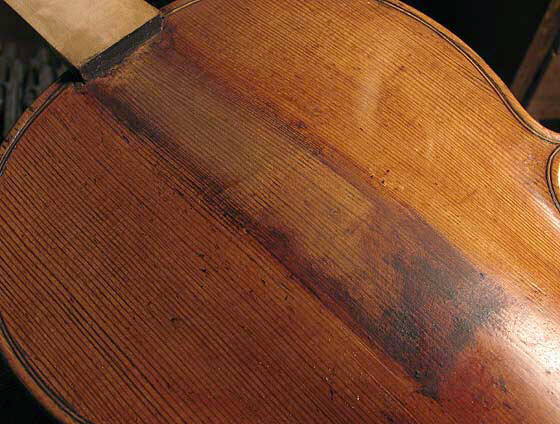 You can also see where 300 years of dirt and polish got pushed up under the edge of the board and never cleaned off, and by the extra-long dirty area at the bottom, how the violin started with a board about that’s shorter than the one it’s had in recent years.